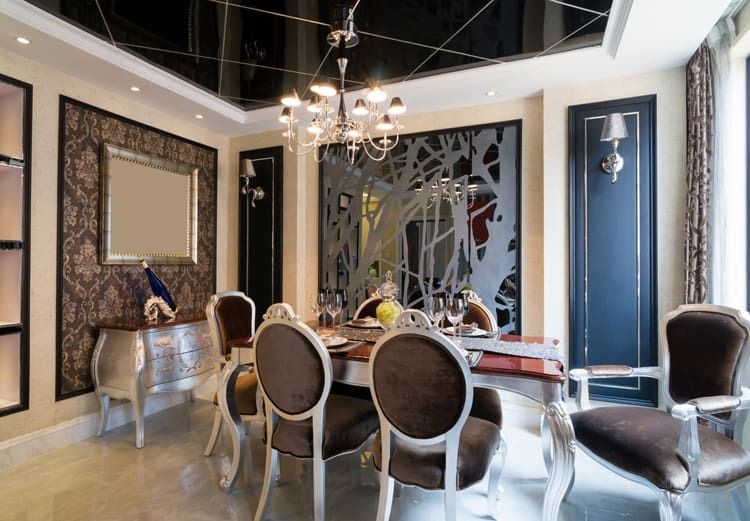 When it comes to taking on a luxurious dining room makeover, you have some big decisions to make that will impact the overall look and feel of the space. Furniture pieces, wall color, lighting and flooring are probably the most important choices, as they will set the tone of the room. 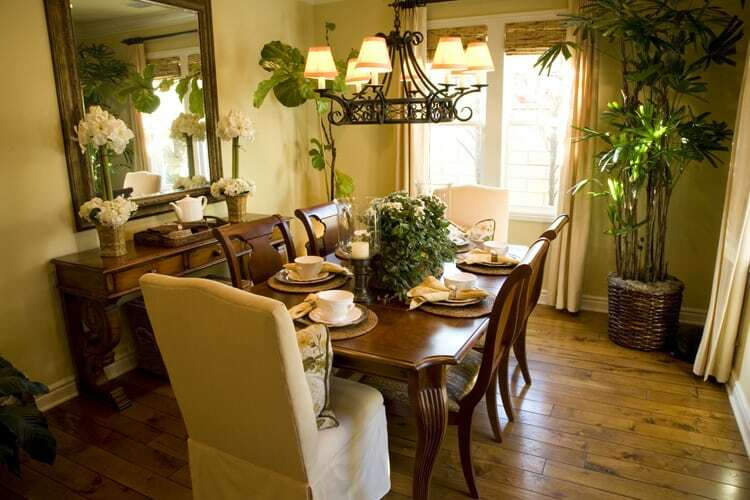 Furniture placement will determine if your dining room feels intimate or expansive. Artwork and accessories are the finishing touches that give your dining room its distinctive personality. 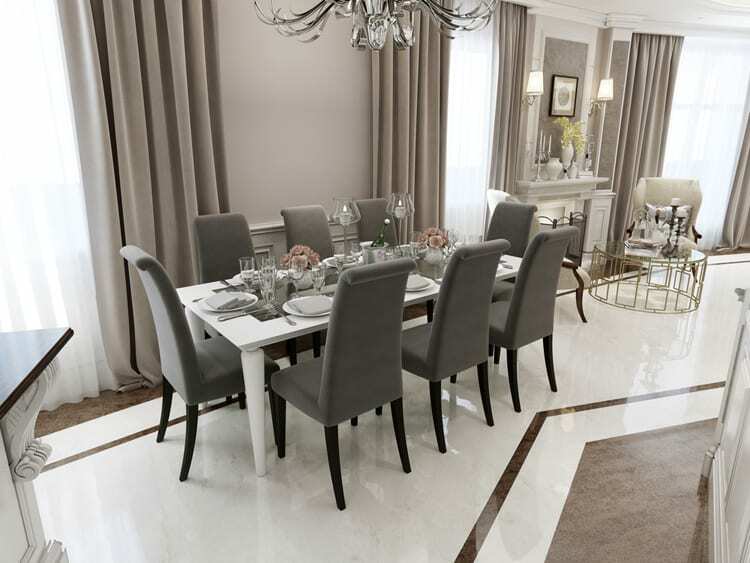 Beyond the physical elements, a deluxe dining room needs inspiration to bring your design vision to fruition. 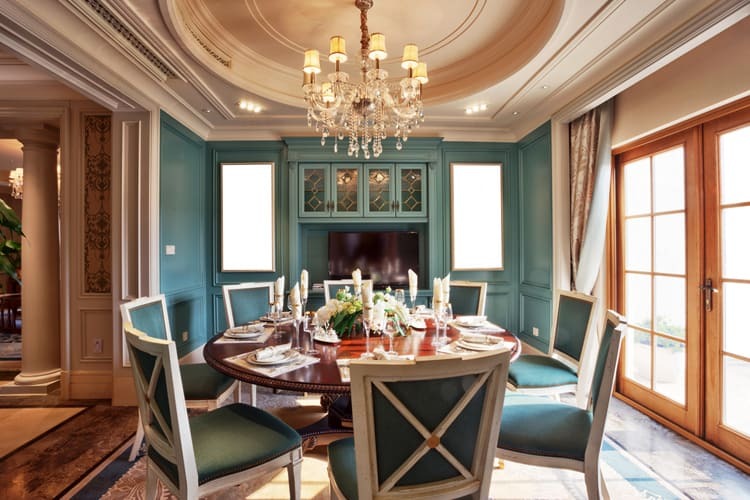 Let your imagination run wild and create a dining room reminiscent of a European villa, Park Avenue penthouse or grand country estate. The choice is up to you. To help the cause, we’ve combed the vast reaches of the design universe to share our favorite dining rooms, which are certain to spark plenty of sumptuous design ideas. 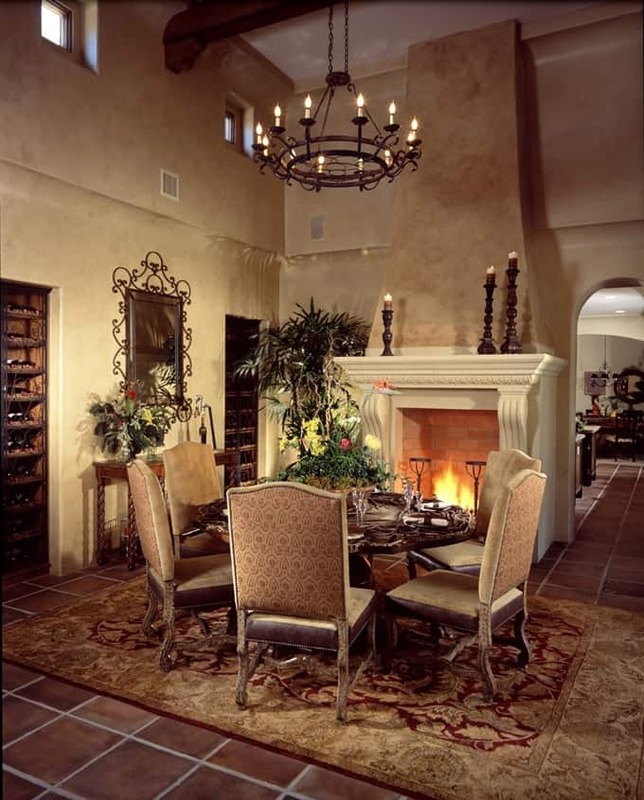 A Tuscan style dining room is the perfect environment to share special times with family and friends. Create warmth and comfort through rich wood tones, natural stone flooring, Italian-inspired pottery and artwork featuring beautiful landscapes of rolling hills and vineyards. Even the smallest touch of pattern on chairs can brighten up a dining space. 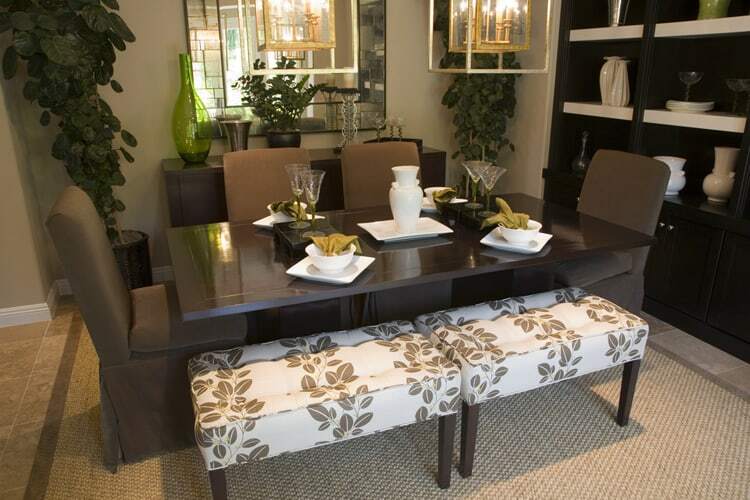 Luxurious upholstery in a contemporary floral keeps the traditional table and chairs from feeling too old-fashioned. 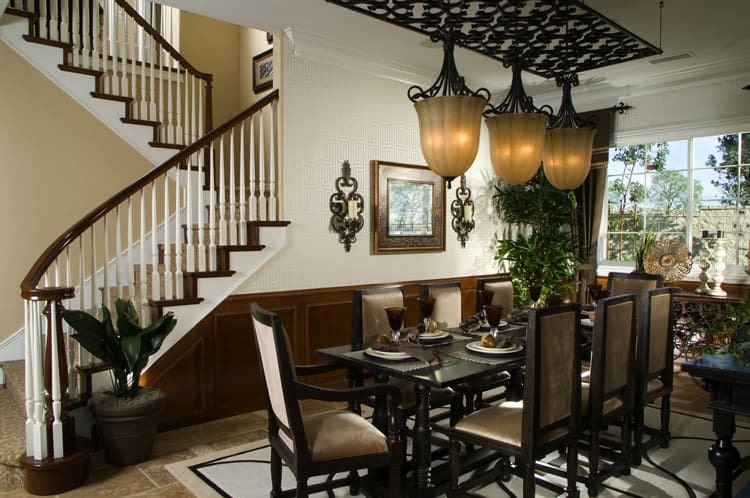 The oversized scrollwork chandelier creates the sculptural centerpiece of the dining room. 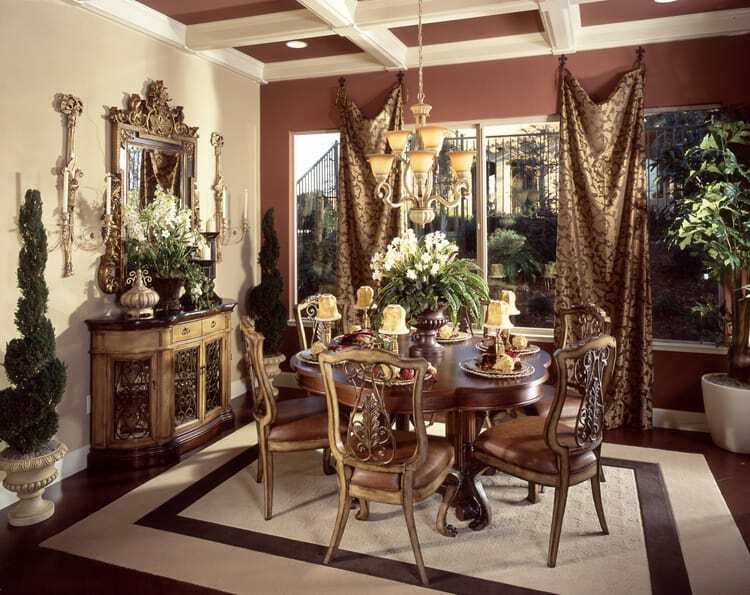 Bring the exotic and romantic mood of British Colonial style to your dining room. The tropical feel is the product of Great Britain’s world dominance during the 19th century. Influences from India, East Africa and the West Indies give this room the look of well-traveled refinement. This dining room has all the traditional elements we love. 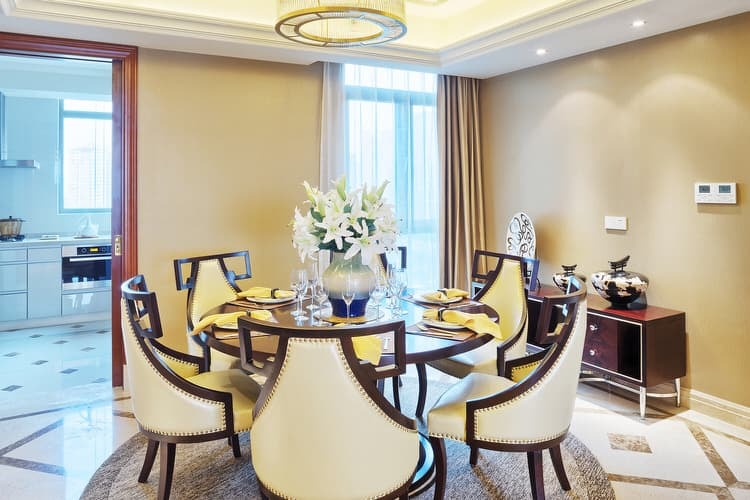 The gold colored walls are a throwback to the days of royalty, adding a sense of luxury that isn’t seen much anymore. 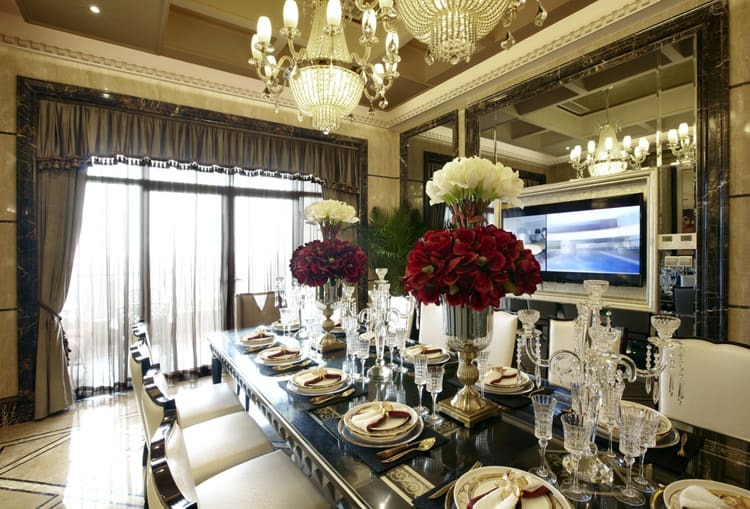 The mahogany Duncan Phyfe dining table, dramatic mirror, sumptuous silk curtains and crystal chandelier create drama beyond compare. 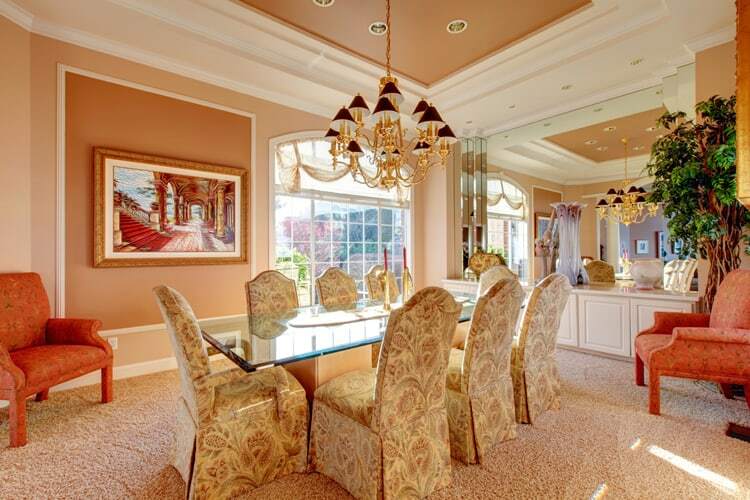 Luxurious dining rooms come in many forms. Take this transitional gem, for example. The monochromatic mocha tones with a splash of cream in the accessories and dining benches make for a dining room oozing with casual sophistication. Wingback head chairs and Louis-style chairs at the same table might seem a little intimidating. Although, these traditional and antique pieces mix nicely when there is a unifying element such as color. 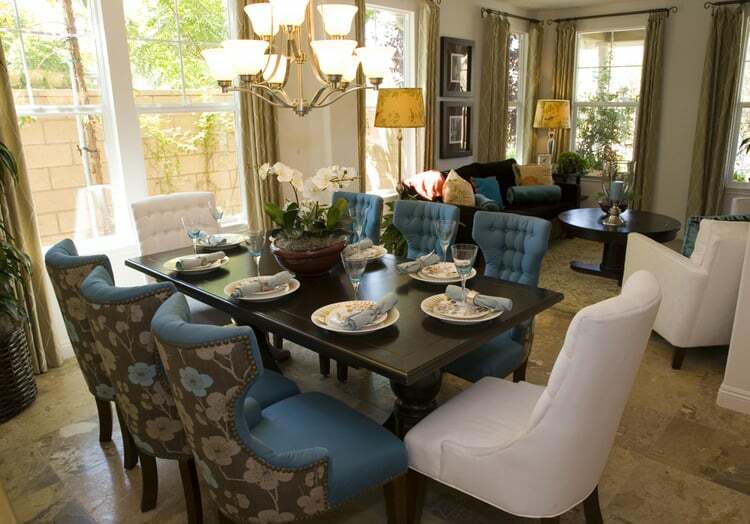 This dining room keeps it light and airy with a neutral palette and hints of soft blue. In this urban townhouse, a color scheme of blue, brown and white is paired with brushed brass, dark wood and natural stone flooring. This combination gives the dining room a cool, elegant vibe. Transitional furniture pieces bridge the gap between dining and living spaces. 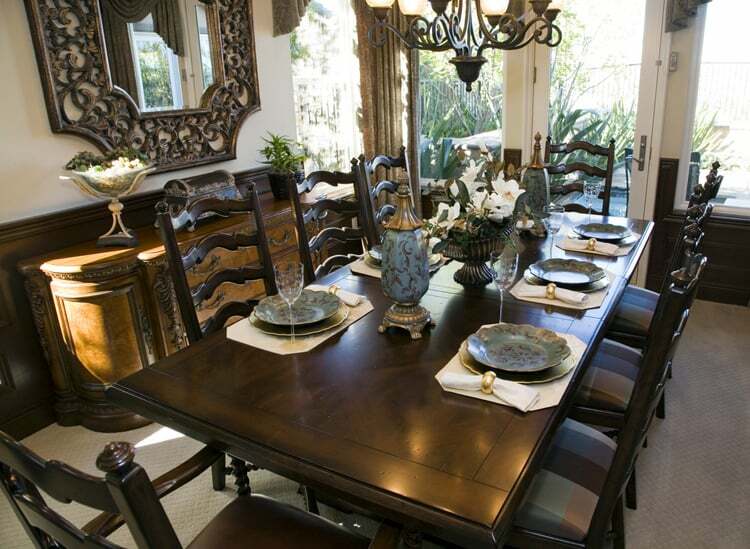 Symmetry can make a dining room feel downright fancy. This room looks like a formal banquet hall just by incorporating the principles of formal symmetry – where each side of the room mirrors the other. The symmetry is also found on the table itself with matching floral centerpieces positioned at either end of the table. 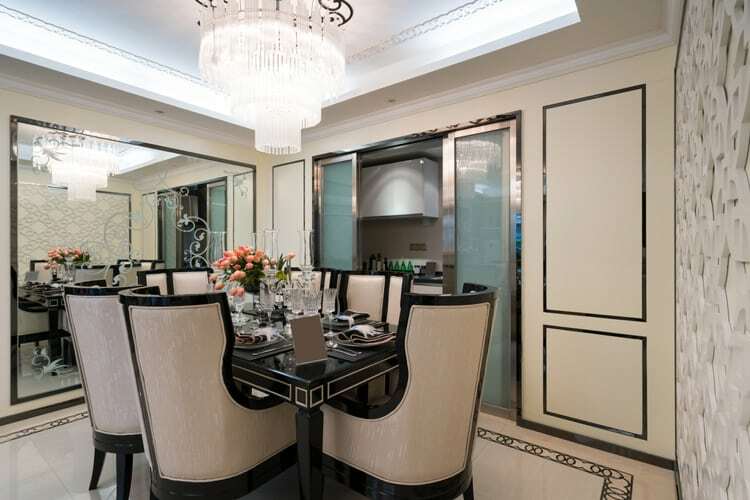 This dining room was not original to the home. The small space was actually a first-floor bedroom. The homeowners added wainscoting to the walls and painted out the fireplace in bright white. The black-and-white color palette creates wonderful contrast and the repeating circles throughout the room ties everything together. 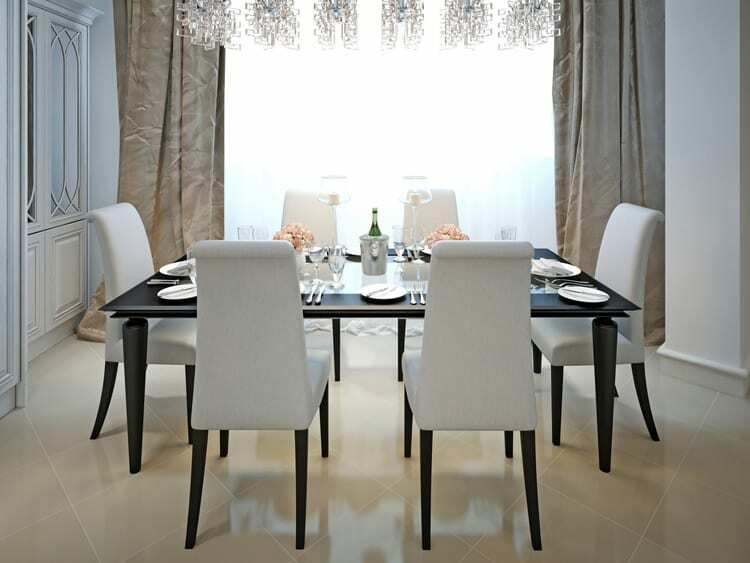 The curves of these parsons chairs are the perfect fit for this contemporary dining room. The mix of patterns and solids break up space and the unexpected addition of the blush area rug gives the dining room a luxurious feel. The ironwork of the dining room chandelier and carved wood detail references the Spanish Colonial architecture of this Los Angeles home. The vintage dining table is paired with hand carved chairs from Mexico creating an inviting space for dining and entertaining. Light and airy was the direction from the homeowner to the designer. The dark contemporary dining table and the white upholstered chairs is really all that’s needed to create a simply luxurious dining room. Sumptuous curtain panels and fairy-like chandelier combine to highlight this otherworldly space. Layers are the way to go when incorporating antiques into your dining room design. You don’t want it to look and feel like a museum, so include layers of color, texture and lighting to give new life to vintage furniture pieces. Light gray walls, matching window treatments and a white table are perfect for this light-filled room above the city. Keep the look grounded with some texture like these classic upholstered dining chairs in rich charcoal velvet. A deep walnut table and upholstered teal chairs complement this dining room’s peacock blue and cream color palette. The circular detail in the tray ceiling mimics the shape of the table and a sparkling chandelier provides just the right tough of luxury in the elegant space. 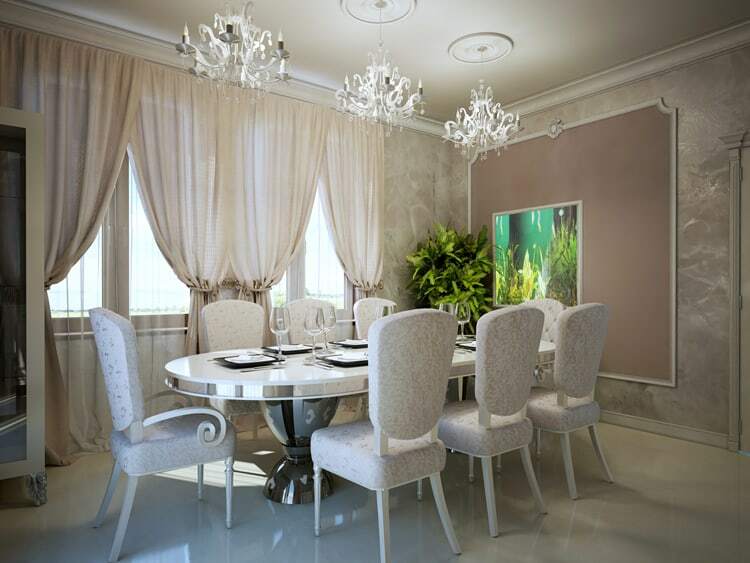 The pretty curves of the chairs and dining table made this room cohesive without feeling too formal. The elaborate wallpaper pattern is coordinating, rather than competing with the simple lines of the room. The lines between indoor and outdoor completely blur thanks to the architect who wanted homeowners to enjoy al fresco dining while inside. To make the connection complete, the colors in the room pick up the hues of the sand and surf in view just beyond the terrace. A hand carved buffet and antique French chairs with paisley upholstery grace the expansive dining room table. 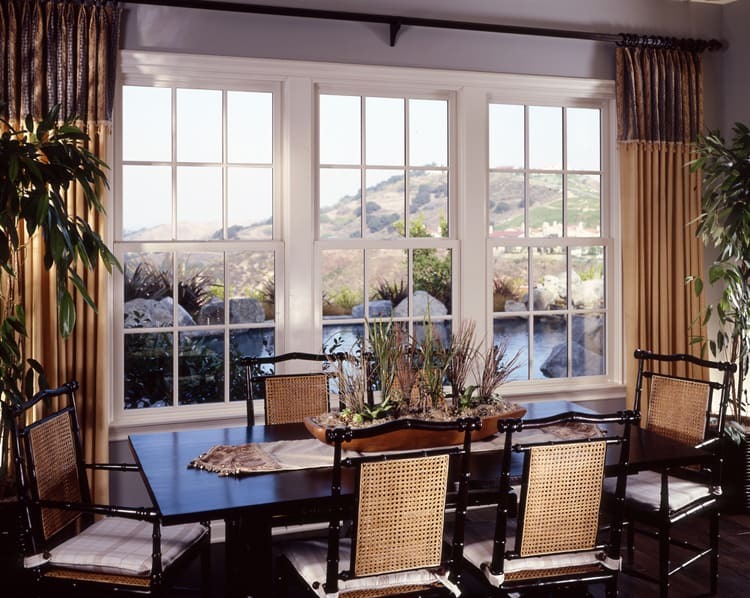 At the windows, panels of open weave linen add a casual note to this formal dining room. 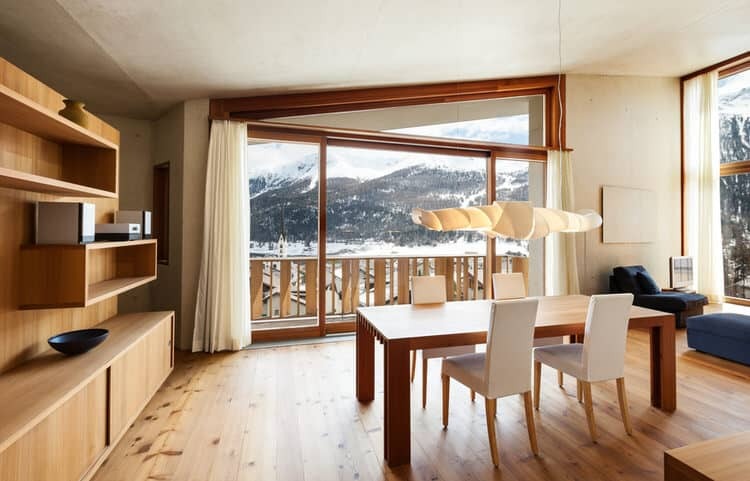 Too much wood in a small dining room can be a bit overwhelming. Think carefully about the pieces you bring in. This homeowner added off-white upholstered chairs and curtains to keep things from becoming too visually heavy. A handsome addition to this space would be a neutral area rug to break up the wood flooring. 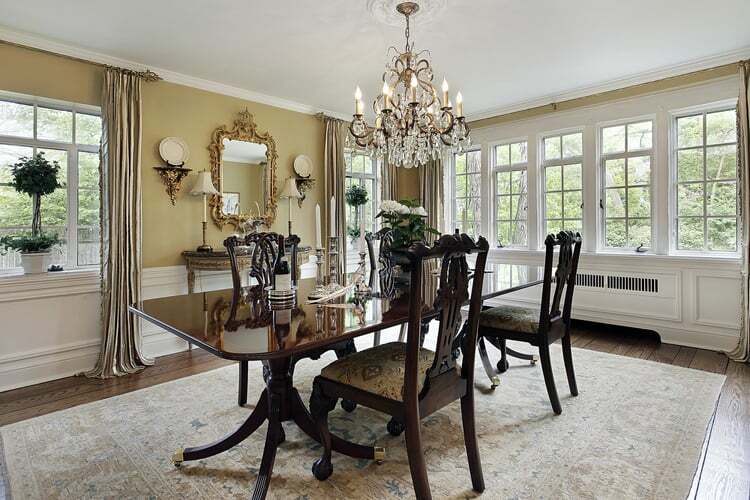 A grand chandelier hangs above the dark mahogany table in this formal dining room. The Aubusson rug was made to complement the fabrics, flooring and wall treatment. The massive fireplace warms the space and adds loads of atmosphere. A chair rail and wainscoting were painted crisp white to provide a classically tailored background for the upholstered chairs, silver leafed sideboard and espresso dining table. 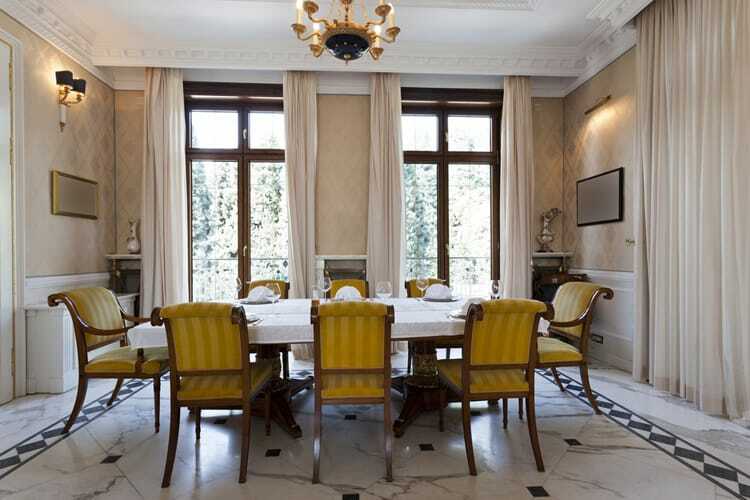 Traditional, antique and contemporary mix together beautifully in this dining room. The designer of this dining room installed a reflective blush and pewter wallcovering to give the space sparkle and feminine sensibility. At night with the chandelier light, the walls have a soft reflective quality that adds to the romance of the room. Focal points like the fireplace and multi tier chandelier really stands out when the dining room is tailored and sophisticated. 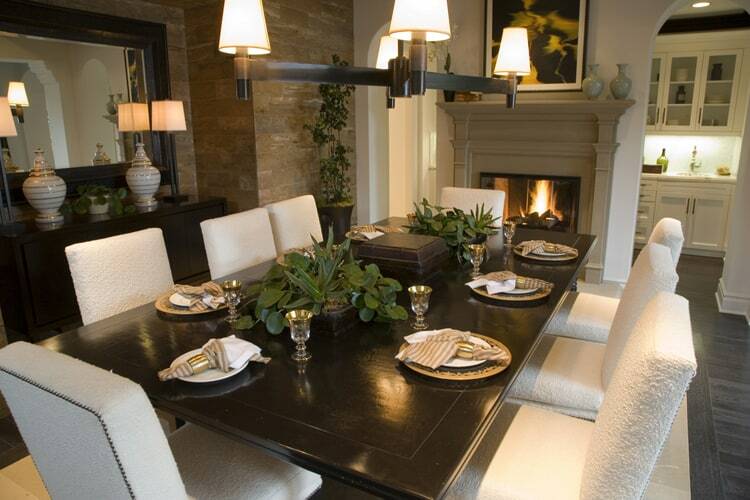 Gray walls, upholstered swoop arm chairs, a glass table and dark wood floors create a cozy, yet luxurious dining space. There’s nothing quite like a dining room with a grand ceiling fixture. This Mediterranean dining room tucked beside by the grand staircase features an amazing reproduction based on an antique lighting fixture spotted in Rome. 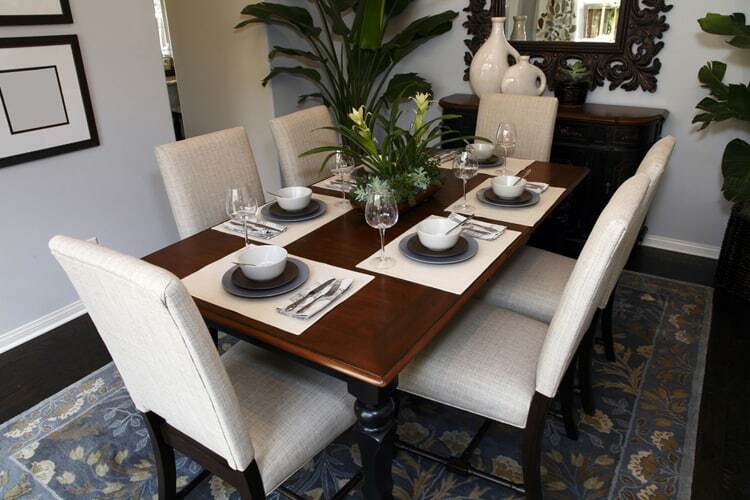 Gorgeous antique cane back dining chairs with bamboo detailing look beautiful with the ebony trestle table. 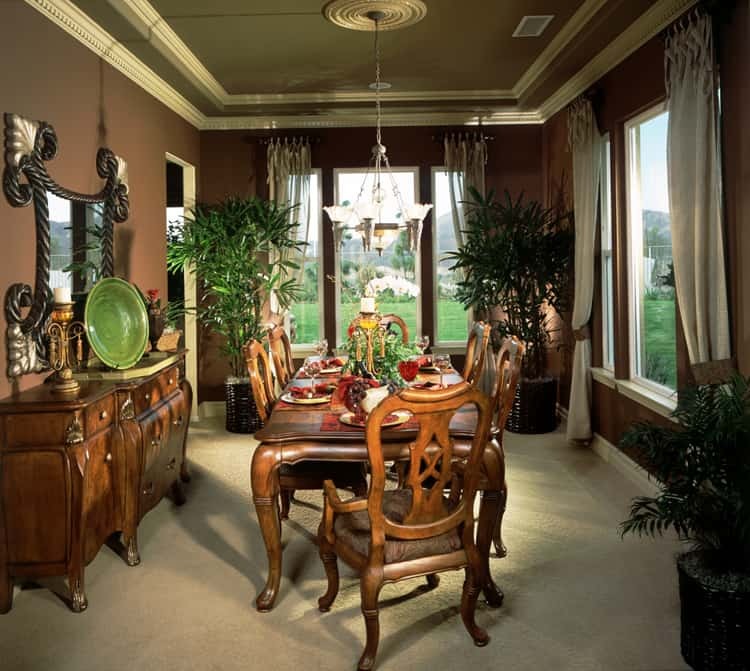 Luxurious silk curtains flank the stunning view and add a hint of color and texture to the neutral dining room. Matching the coffered ceiling with your accent wall creates a sense of cohesiveness in a dining room that borrows from variety of design styles. 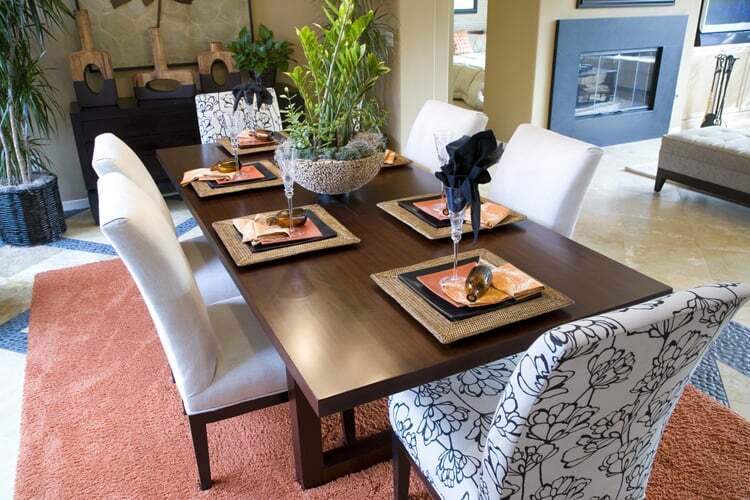 The muted russet paint color picks up reddish undertones in the furniture and flooring. Just like the morning sun peeking through cottony white clouds, this dining room color palette is a lucky coincidence. When the designer brought in these sunny yellow chairs, the mood of the room completely changed and instantly went from subdued to cheery. You probably don’t need a formal dining room 24/7/365. This example is perfect for hosting holiday get-togethers, yet cozy enough for lounging after dinner on a Sunday afternoon. If you’re short on real estate in other rooms, bring accent seating into the dining room to create additional living space. 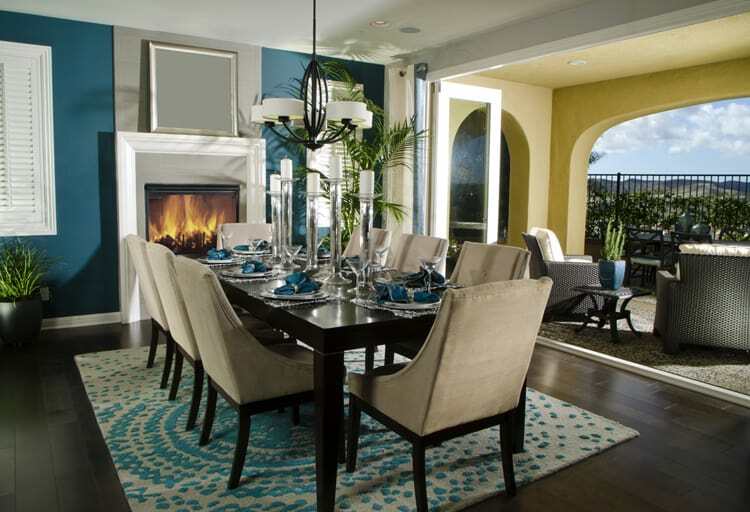 This deep color could be viewed as a daring choice for a dining room. To keep the room from feeling too closed in, add contrasting molding to break up the dark color. The combination of ecru and eggplant gives the room a stately feel. 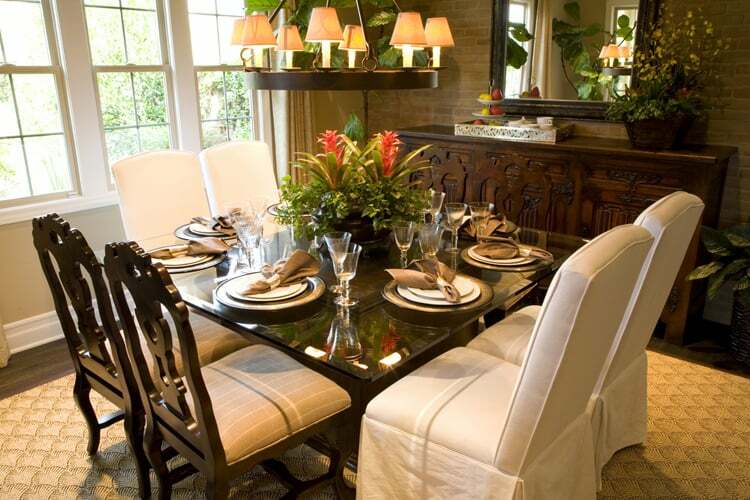 Nothing makes a dining room more inviting than a custom harvest table big enough to accommodate large family dinners. 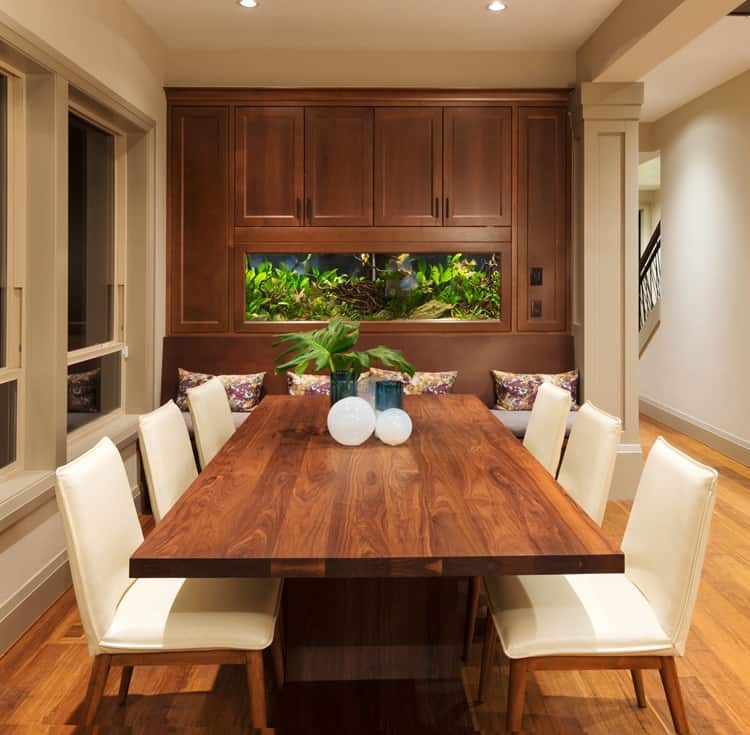 To keep the wood paneled room light, the homeowner chose slender upholstered chairs in cream and created an impressive wall aquarium as a focal point. This dining room is tricky because it is so open. 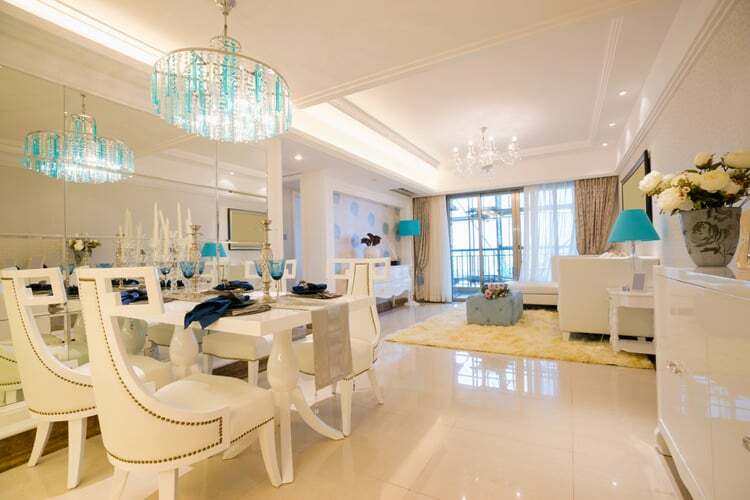 The modern, white lacquer dining table and crystal chandelier in aqua delineate the space. 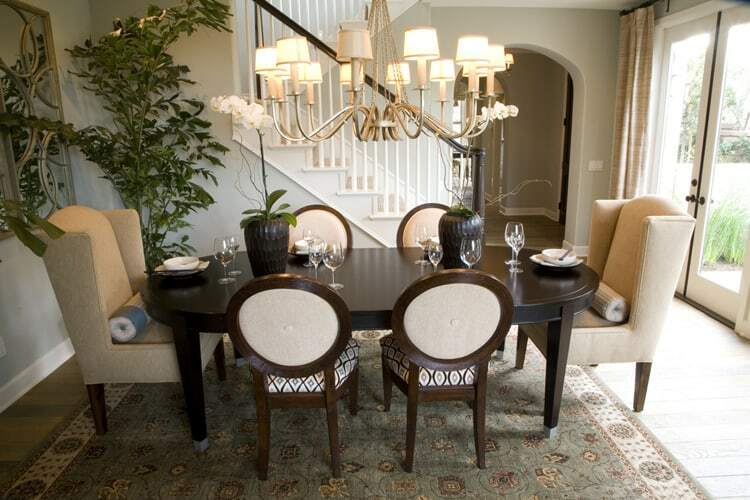 The graceful lines and nailhead trim of the contemporary chairs give the dining room certain savoir-faire. 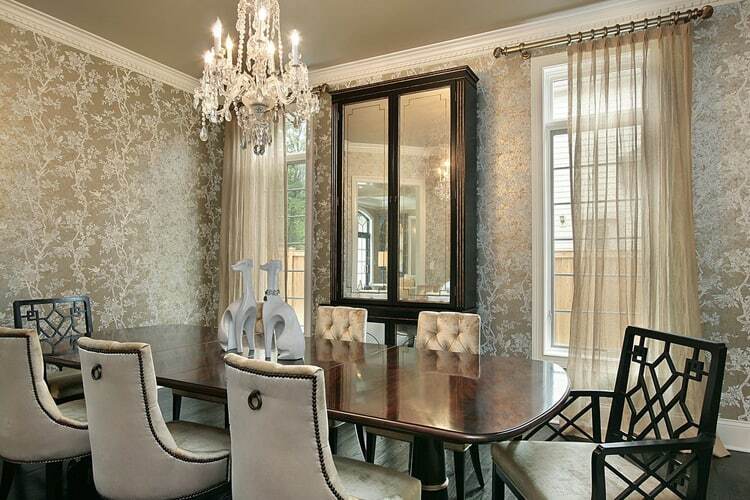 Luxurious fabrics on the table, chairs and curtains give this dining room a sense of grandeur. 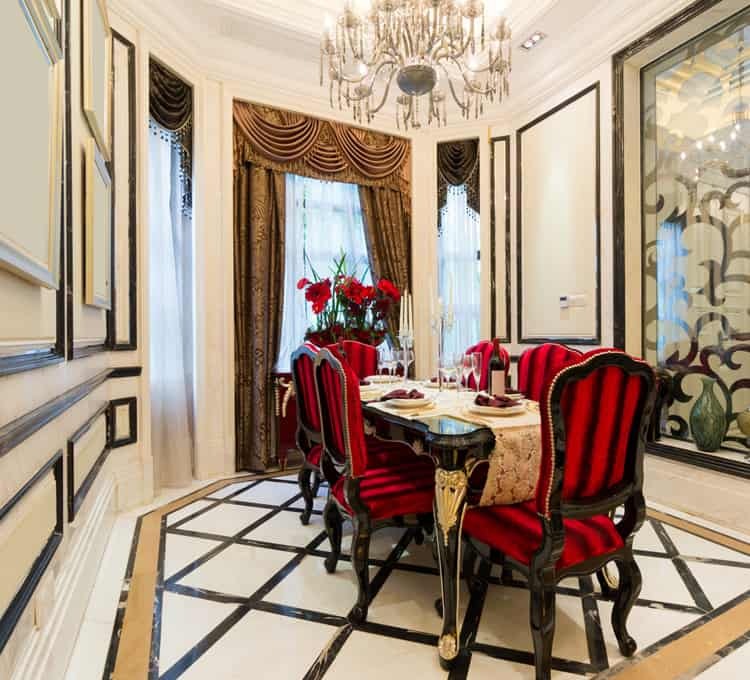 The inlay flooring, trim molding and etched glass wall add a stylish twist when paired with the bold color palette of red, black, gold and white. This monochromatic room is anything but dull with its soft, reflective wallpaper, mirrored wall and sophisticated touches of black. The sparkle from the chandelier adds just the right amount of glamour. The dining room of this Toronto penthouse mixes modern, whimsical and traditional elements to create a way out take on luxury. 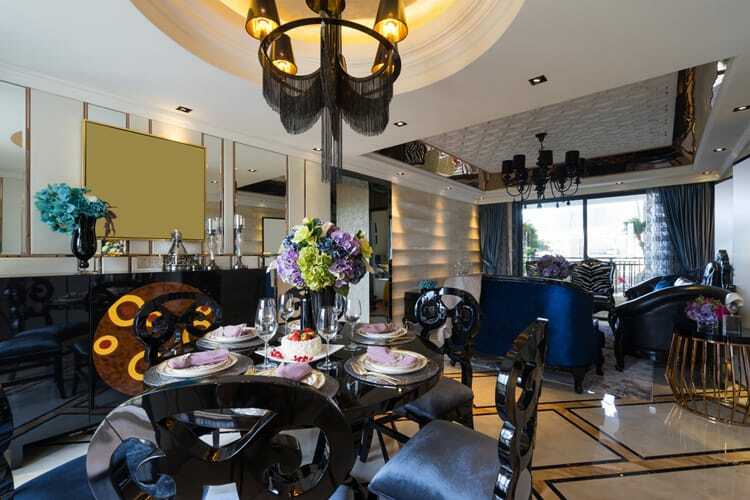 The interpretive Louis chairs, black lacquer buffet, and fringed chandelier create a space Phillipe Starck would love. 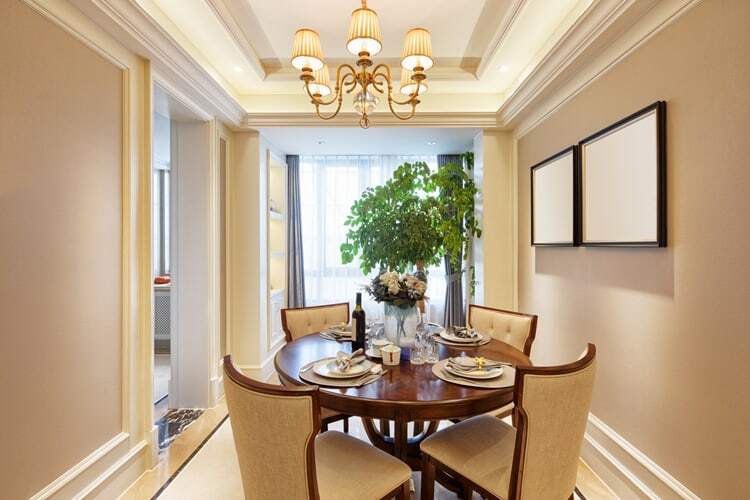 This dining room has room for a small round table and four chairs. That’s all. The designer decided to give this tight space character by concentrating on the fifth wall. Much can be done to add style to a ceiling with wallpaper, coffering or a beautiful tray effect like this one.